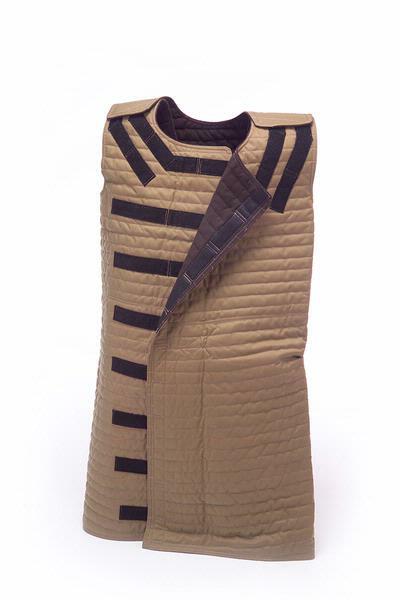 Derby Safety Garments & Safety Blankets are made with multiple layers of 1000 denier ballistic fabric laminated to a polyester inner padding and are quilted using heavy duty nylon thread. Derby Safety Garments have an internal anti-abrasion fabric quilted into the top portion to help prevent chafing. Only premium hook and loop fasteners are used for superior performance. The color of the Safety Garment & Safety Blanket is a neutral taupe shade, which shows blood easily if present. Independently tested to exceed CA 117 and 16 CFR part 1632. The Safety Garment & Safety Blanket can be washed and dried using your standard methods. NOTE: See link to our cleaning instructions. Do not bleach. Density of the Safety Garment & Safety Blanket makes it difficult to roll and fabricate into a noose. Easy fitting, one size fits most.